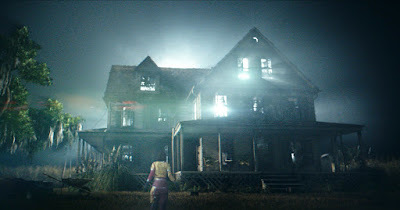 The new horror film, 10 Cloverfield Lane (2016) may not connect quite as explicitly to the original Cloverfield (2008) as some longtime fans hoped it would, but this new cinematic effort from J.J. Abrams’ Bad Robot nonetheless achieves something that only the best horror films manage. The film takes a classic genre scenario -- like the end of the world, for instance -- and utilizes that premise to depict something else; something significant about human beings and their relationships. 10 Cloverfield Lane is a tense, contained, brilliantly-performed thriller, and one which finally goes off the rails only a little, in the final five minutes. But much more important than that small failing, the 2016 film recreates dramatically for the audience the thought process that an abuse victim makes when faced with domestic violence at home. With apologies to the Clash, that process involves the eternal question: should I stay or should I go now? Specifically, the film’s protagonist, Michelle (Mary Elizabeth Winstead) finds herself trapped in a bunker with a strange, perhaps dangerous benefactor named Howard (John Goodman). Should she be grateful for Howard’s rescue, and his decision to bring her back to the bunker, given his explanation that the country is suffering a terrible chemical or nuclear attack? Or instead of remaining with the creepy and unpredictable Howard, should Michelle attempt escape. Should she run, and see what’s out there, beyond the bunker, for herself? 10 Cloverfield Lane proves remarkably clever in the way it focuses on Michelle’s answer to the question of remaining vs. running, and makes the audience weigh the selections along with her. At various points in the film, viewers will feel differently, and weigh Howard’s menace differently. There's a line after all, differentiating weird and dangerous. Watching Howard in action, we are always asking: has he crossed that line? In the end, perhaps, Michelle comes up with a third option for survival, and it’s an act of self-actualization that, literally-speaking, puts the character in the driver’s seat. It’s a perfect apotheosis, given what has preceded it. 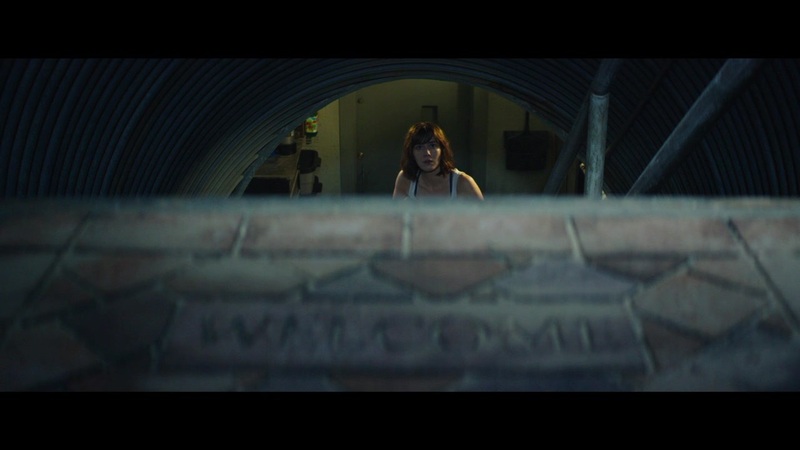 But in total, 10 Cloverfield Lane's thematic through-line -- about how to deal with danger in the home and hearth -- allows the movie to operate on more than simply a literal level. Michelle (Winstead) runs away from her boyfriend, Ben (Bradley Cooper), after a fight, and begins a long, night-time drive out of the city. Unfortunately, she is in a terrible accident, and when she wakes up, Michelle finds herself in a bunker controlled by the enigmatic former Navy man named Howard (Goodman). Howard has tended to her wounds, but insists Michelle can’t leave; that the world has suffered an attack. It’s a “big one,” he observes, though he is not certain whether it is “chemical or nuclear” in nature. Another survivor, Emmett (John Gallagher Jr.) is also living in the bunker, and notes that he helped Howard build the facility, so that he trusts him. Nonetheless, Michelle attempts to escape, and nearly gets out a door to the surface when she is confronted there with a bloody survivor, Lesley (Suzanne Cryer), who has been exposed to the contaminated air. Realizing that some elements of Howard’s story must be true, Michelle settles in, making a go of it in the bunker, which features a kitchen, common room (with DVD player and juke box…) and bathroom. Unfortunately, as Michelle gets to know Howard better, she also grows convinced that he hurt his daughter, Megan, or another young woman, named Brittany. Emmett reports that Brittany disappeared two years earlier, and was never seen in town again, and Michelle thinks she knows precisely where she ended up. Michelle commits herself to escape, and with Emmett’s help begins to make a gas mask and protective suit, hiding it from Howard. One of the primary critical complaints about the original Cloverfield (which I loved…) involves the found footage technique that marks the film, and the fact that the young actors did not seem to be playing distinctive characters in a well-written scenario. 10 Cloverfield Lane eschews the found footage technique, and thrives as one of the best-written Hollywood genre films I have seen in some time. The narrative is craftily and cunningly constructed so that ambiguity reigns. And as I've written before, for a horror movie to thrive, you need ambiguity. The longer a film can go without answering many questions, the longer it can maintain mystery and suspense. Basically, we don’t know what Michelle should do, given her predicament, and the movie attempts to trick us into leaning one way or another in regards to the stay vs. running dynamic. Specifically, Michelle is introduced as a character who always runs at the first sign of strife. She abandons her boyfriend, Ben, over a fight, even though he calls to apologize. We can tell he’s a good guy, of course, because he’s voiced by Bradley Cooper. Later in the film, Michelle tells Emmett that she always runs when confronted with a threat. That she ran from an abusive man in a hardware store, and that she similarly ran from her abusive father in childhood. Thus, the audience is led to believe that “running” is the thing -- the character challenge -- that Mary must overcome. Therefore, she should trust Howard and stay in the comfortable bunker with him, right? 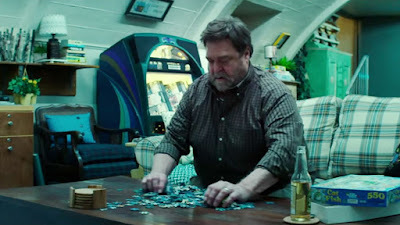 10 Cloverfield Lane also introduces Emmett, a character who has always “stayed.” He has lived within a “square radius” of “forty miles” his entire life, and now regrets that fact. In his wallet he keeps the yellowed, frayed bus ticket to a college he got a scholarship for, but never attended. He was afraid, you see, that he couldn't cut it; that other students would be better than he was. So he remained exactly where he was. He never traveled, and accordingly Emmett never grew...he never evolved. Thus he demonstrates to Michele the danger of remaining in a situation that is not good, or not healthy. And then of course, there’s Howard. The accomplished veteran actor, John Goodman walks a fine line with this enigmatic character. There is no doubt that Howard is strange, socially-inept, and creepy. But by the same token, he saved Michelle and Emmett, and is sharing his shelter and all of his supplies with them. More than anything else, Howard seems lonely. He seems to love his daughter, and to miss her very much. Howard fears she has died in the attack. But on the other hand, Howard is also given to bouts of extreme temper. His hands actually shake when he gets angry. And he is absolutely demanding of “love,” from his wards. In his words, he wants to be shown some “appreciation” for preparing the bunker, and for saving Emmett and Michelle. He desires respect and gratitude, and is not shy asking for those things. So...a jerk? Or a clear and present danger? And this is where the script proves truly clever, putting the audience in Michelle’s shoes, and asking it to consider what she should do. Her reasons to stay are that “there is no place to go,” according to Howard, and that is also a key reason -- make no mistake -- that victims of abuse remain in dangerous households. They often feel that no one else will have them, or that they can’t make it on their own. Next, Michelle attempts to get along with Howard, and “hope for change,” that he will prove nice and normal, not twisted and sick. She wants to give him a chance. Once more, this is exactly the reason victims remain in a home with an abuser; belief that change is possible if you just give the abuser one more opportunity. Similarly, there is a danger in leaving or running and Michelle must consider this factor too. Howard is quite convincing about what will happen to anyone who leaves the bunker, and so it is not an option that promises relief or escape. He threatens them that something terrible happen if they leave the bunker. This is also why abuse victims stay. Threats from abusers about what could happen if they leave. But importantly, Howard also provides a form of stability. It’s not “economic dependence,” necessarily, as is the case with many victims of abuse, but close to it. In the bunker Howard offers fresh air, food and water, indoor plumbing, and physical safety. Choosing to run means choosing to walk away from safety and shelter, permanently. Oppositely, what happens if Michelle stays in her “rut” and again runs away from something good, like she did with Ben? We’ve seen her run from her boyfriend over an apparently normal “couple” fight, which suggests she is closed off and unable to see the “positives” presented by Howard’s shelter and friendship. The movie dances, with wit and cunning, from argument to argument, as Michelle attempts to figure out whether she should resist Howard, or accept the safety and security his way offers. Thus 10 Cloverfield Lane is a virtually perfect metaphor for the choices a victim must make when choosing whether to stay or leave an abusive home. In the end, as I noted in my introduction, Michelle pinpoints a third way. In the film's coda, she sits at a literal crossroads, in the driver’s seat, and makes a decision not to stay a victim, and not to run for shelter. Instead, she resolves to fight. I loved this ending and the self-actualization it provides the character of Michelle, but it is preceded by several minutes outside the bunker in which Michelle experiences exceedingly good-luck in combating…well…external threats, let’s just say. These threats are visualized in stunning, terrifying fashion, which is a plus. But it’s hard to believe that after so many have died, Michelle would be victorious in her battle with this particular force. One might state that she does so, thematically, because she has solved the puzzle (represented by the jigsaw puzzle in the bunker…) of Howard’s motivations. So she is now prepared for the larger challenge of the "outside world." But good against a human victimizer is one thing. Good against the very powerful threat on the surface is something else entirely. It's a bit unbelievable. Still, I don’t want to accent what I feel is a small flaw in an otherwise a remarkably suspenseful, remarkably engaging film. John Goodman is superb as Howard, and never reals too much too soon. But I guess I walked away from the film in awe, in particular, of Winstead and her gifts as an actor. I have liked her work before, in The Thing (2011) prequel, in particular, but she is so good in this movie, and you will find yourself rooting for Michelle every step of the way. In 2008, I felt that Cloverfield (2008) revolutionized the giant monster/kaiju movie with its street-level, found footage approach to that type of tale. In a very real way, 10 Cloverfield Lane is equally as revolutionary in modern Hollywood. It’s a well-written movie about three-dimensional human beings making difficult choices, not two-dimensional superheroes battling super-villains. Lean, claustrophobic, and superbly acted and directed, 10 Cloverfield Lane is about more than the monsters “out there.” It’s about the monsters some people deal with every day, and how to survive them. What does the world Cloverfield mean in terms of a franchise at this point? A lot of fans are obsessing on how these two movies fit together. I see the two movies as being joined under one umbrella, broadly-speaking, of unity. To me -- at least so far -- the word Cloverfield means, simply, a cinematic Twilight Zone. We’ve now had two superb, scary genre experiences. They are largely stand-alone or independent of one another, and yet both Cloverfield movies contend expertly with human nature in both ordinary and extraordinary situations. Like Howard, the filmmakers here have "focused on being prepared," and thus "here we are" with an unconventional second entry that rivals, and in some ways, surpasses the first. 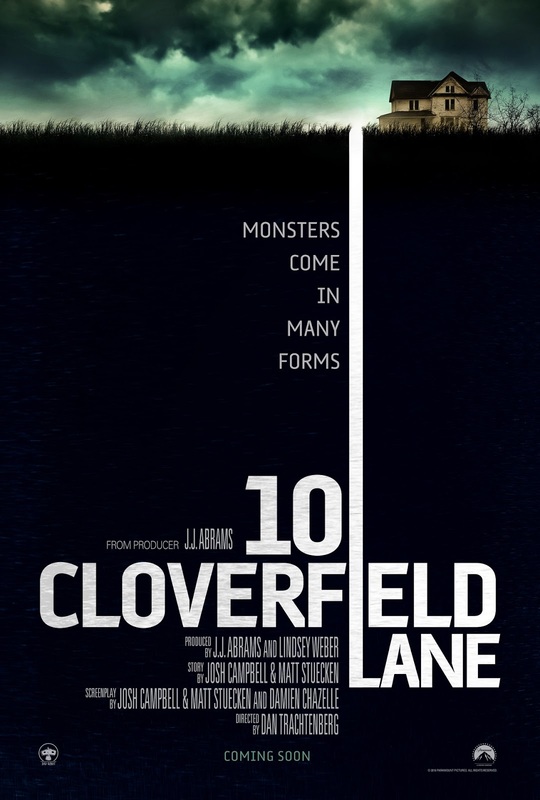 10 Cloverfield Lane does so, however, via the auspices of good acting, a well-constructed script, and other values largely unrelated to special effects. I love this review...I really want to see this movie!